The first piece of a throwing motion is simply setting up your body — specifically your core and shoulder — in a position that allows you to move your arm through a throw. Replicating the shoulder movement that you perform at the start of a throw is a great quick fake option. In fact, sometimes a simple dip or “shimmy” of your shoulder may be all you need to get a defender to bite on a fake. If the number one rule of faking is fake like you throw, the number two rule is fake for a reason. Faking wildly and constantly does nothing but tire you out, and might even cause you to miss open options that develop downfield. It’s absolutely fine to hold on to the disc without faking for a few stall counts — survey the field, identify what options are developing, and set up your fakes intentionally when you know what you want to throw to. You make a strike cut and get open with lots of momentum towards your scoring endzone. 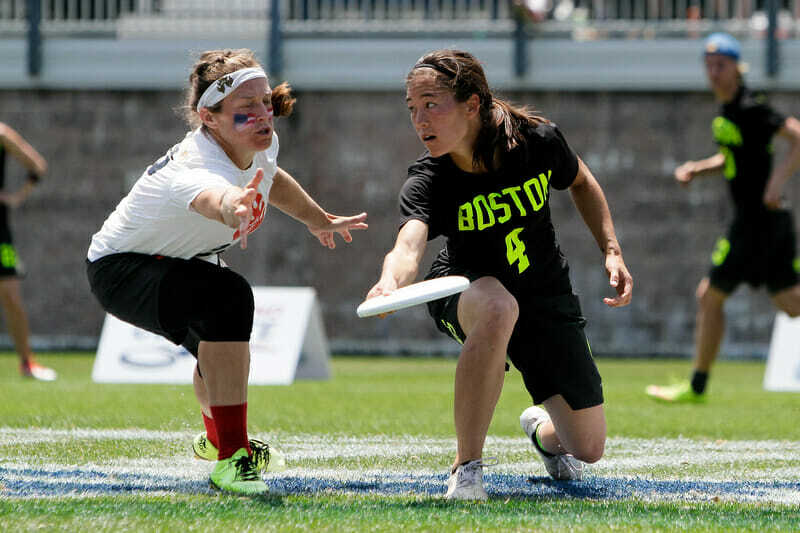 Translate that momentum into a big huck fake — your trailing mark might over-pursue to the open side in an attempt to stop the huck, giving you lots of space to swing the disc back to the break side. Fakes are also an incredibly effective way to communicate with the rest of your team on offense. In general, a hard fake towards a your own teammate communicates that you are not prepared to throw to their current cut and they need to change direction. Within this general framework, there are lots of different ways to communicate something more specific with a well-placed fake — just make sure your whole team is on the same page. Comments on "Tuesday Tips: How To Fake Effectively, Presented By Spin Ultimate"